If you’ve got any questions about Scottish Terriers, or any health tips you’d like to share, or you’d just like to contact us more privately, then please use this contact form to get in touch with us. This is a ‘safe’ place in which to discuss anything about Scottish Terriers; your love of them, your fears for their health, your grief for those that you’ve lost. We are not Vets, just avid scottie lovers, so if you think your beloved Scottie is ill, please, please, please, go speak with your Vet first, however, we’d be more than happy to share your findings as it might help and encourage other scottie owners to get help. Apocaps ... natural cancer treatment or what? If you have or are experiencing similar health issues with your Scottie, please make sure you visit your own Vet. 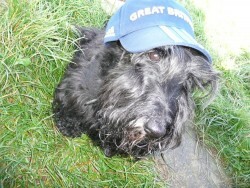 However we hope you will feel able to share this with us as it may help other Scottie Owners. Thank you for "Making a Difference for Scotties".